You would be mistaken for thinking that Scotland was the land of enlightened land access and ownership for all, given the high profile success of community-spirited buyouts such as Eigg, Gigha and the recent campaign against Donald Trump's Despicable-Me impersonation (if only it were impersonation). But things are not as they seem and a new book which has opened my eyes to the deep land injustices of Scotland (not just the Clearances) is Andy Wightman's 'The Poor Had No Lawyers - Who Owns Scotland And How They Got It', published by Birlinn. 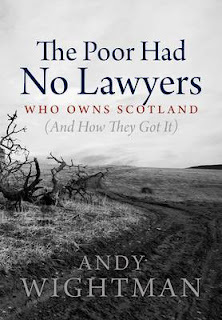 Andy is a longstanding campaigner and investigative journalist who runs the excellent website Who Owns Scotland, dedicated to a transparent listing of all the landowners in Scotland and how they got the land. The book to accompany this campaign is a follow up to his 1996 book Who Owns Scotland and goes a lot deeper than many landowners would feel comfortable with. It is refreshingly polemic for such a detailed analysis of 'feus', 'non domino titles', 'superiorities', 'entails' and all other manner of highly dubious legal tricks implying righteous ownership of our lands and commonties. In a deeply researched account of the history of landgrabbing in Scotland, Robert the Bruce does not quite appear the hero some would make of him. Bruce was a murdering warlord who parcelled up Scotland for his own gain and influence, selling off land under feudal tenure to foreign lords and royalty, disenfranchising the people from a barely bawling Scottish state. The centuries fell one after the other as the rich and influential sold off a Scotland they simply did not own. Nobles colluded with the church and the Reformation helped 'legalise' their ownership by highly dubious acts such as the Acts of Registration and Prescription of 1617, 'sealing' land ownership in the hands of the rich who could afford Edinburgh lawyers and felt that a brief tenure of land (20 years!) was enough to claim the deeds to it. And so it went on through the tragedy of the Clearances until, all too belatedly, we had the Abolition of Feudal Tenure Act in 2000. In that longue durée of 8 centuries, Scotland's land, totalling 19.5 million acres, lost over 10 million acres to 1550 private landowners in estates of over 1000 acres! And it has not slowed down - modern land grabs by the rich have attempted to seal off land for private use, tax benefit and corporate expansion. Andy Wightman feels the law must go a lot further to protect our common land from total disappearance: land laws must be repealed, Crown rights should be abolished, Land Funds and Land Policies should be enshrined in statutes for the benefit of communities and our new devolved government should set our Law Commissioners the task of reform on the scale Lloyd Goerge once attempted. We may have National Parks, the Right to Roam and the new Community Buyout rights, but the bald facts are that Scotland is still at the mercy of overpaid law firms, absentee landlords, the self-absorbed rich and far too few enlightened enough to hand back something to the people.